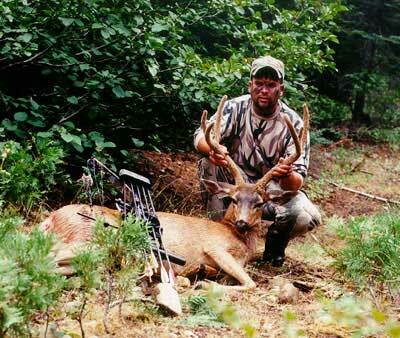 Here is a photo of the blacktail I harvested on September 2, 2000. He is a respectable 3x3. I shot him with a Hoyt Raider at 35 yards. My Carbon Express arrow brought the Muzzy 100 to the mark. I was able to get this buck near Quincy, California. I have not had him scored as he is at the taxidermist. Editor's Note: Paul, "respectable" 3x3? We'd say a "Great 3x3!"